ASRock, like most manufacturers, didn't rename its motherboards based on the updated (fixed) revision of Intel P67/H67 chipsets. They just put stickers on boxes and motherboards saying "B3". The same page informs you about an extra year of warranty, if you buy a B3-stepping board before the end of June. ASRock P67 Pro3 is the second cheapest model in the company's Intel P67 lineup. It only differs from P67 Pro, the cheapest board, by having USB 3.0 and eSATA, a more complex CPU VRM, and a POST indicator. Above P67 Pro3 are the high-end P67 Extreme4, P67 Extreme6 and Fatal1ty P67 Professional, but buyers' interest towards those is inversely proportional to price. 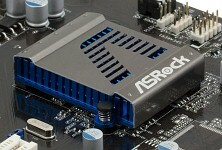 On the other hand, ASRock offers a lot of boards based on the integrated H67 and especially H61 chipsets. These solutions should be cheaper and you'll easily find one for yourself. All the more so because a lot of P67-based motherboards are aimed at overclockers and SLI/CrossFire enthusiasts. In other aspects H61/H67-based products may be better for you. As you can see, P67 Pro3 isn't a choice for a multi-GPU machine, but it offers decent expandability instead: 3 x PCI, 3 x PCIe x1, and only one of those slots will be obstructed by a large graphics card. 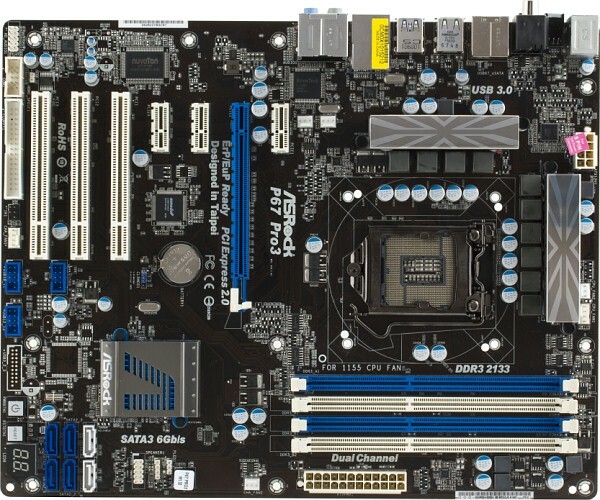 ASRock P67 Pro3 is a full-size ATX board, so there are no densely element clusters on the PCB. Still, SATA slots could've been horizontal, because it's actually convenient, even if there's enough space. There are no IDE connectors and that's hardly a surprise, because Intel stopped supporting this interface long ago and it was eventually ousted. But, interestingly enough, P67 Pro3 has FDD and COM ports! The reason is simple: these interfaces are supported by Nuvoton NCT6776F system monitoring controller that has to be onboard anyway. So ASRock only pays for the connector and related circuitry. But seeing these legacy interfaces onboard is strange nevertheless. Another peculiarity (that is actually found on latest ASRock boards) is the proprietary cooler mount dubbed Combo Cooler Option. 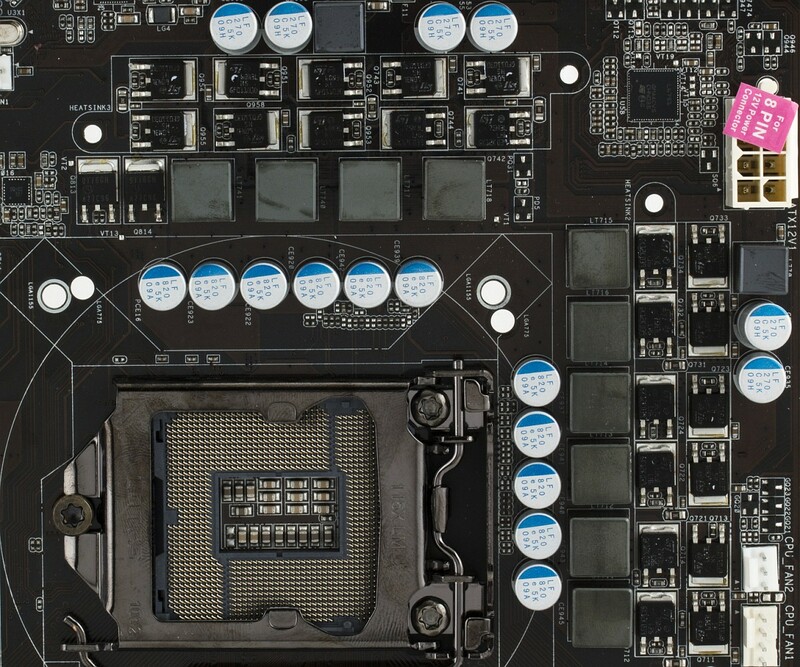 On Socket 1156 motherboards, CCO allowed to install older (and cheaper) Socket 775 coolers. And since Socket 1156 and Socket 1155 are mounting-hole-compatible, the list of supported coolers is even longer. If you don't know what CCO is, it's basically two sets of mounting holes around the socket. A Socket 775 cooler will have to be rotated a bit, but it doesn't make its outer dimensions much bigger. While the CPU VRM is formally powerful, the promised 8 phases are actually provided by a 4-phase PWM controller, i.e. those phases are sort of 'virtual'. But every 'virtual' phase still has a choke and a couple FETs, so considering there are two System Agent phases (with 4 FETs per each), you can be sure the motherboard will work fine with high-end processors in the Turbo Boost mode. Traditionally, all capacitors are polymer, made by Japanese Nichicon. In other words, it's a decent mid-end solution without either luxuries or excesses. The cooler matches the CPU VRM. Speaking of cooling, we mostly mean heatsinks on CPU circuitry MOSFETs, because the chipset with its minor TDP doesn't require any (although it still has a small heatsink with a decorative panel). So, the CPU VRM is covered by two finned heatsinks of average size which do their job well, even though there are no heatpipes. We didn't have a single overheating issue during tests. Other motherboard peculiarities include a POST indicator (the legend is provided in the manual) and onboard Power & Reset buttons. The more useful Clear CMOS button is more conveniently situated on the backpanel. Finally, there are as many as six fan connectors. Five of those support speed control and all can be monitored. Speed adjustment isn't very flexible though: you can only set the desired temperature and the speed level of 1 to 10. ASRock implements UEFI into all motherboards based on the new platofrm and is generally a supporter of this technology. We can't say anything about the supposedly faster bootup, but trying to detect up to a second of difference is just ridiculous anyway. Subjectively, P67 Pro3 proceeded to load Windows very quickly. Like all competing boards. Booting up from 2.2TB and more capacious hard drives is supported too (like by all competing boards), but of course, you'll have to have a 64-bit Windows 7 or Vista. 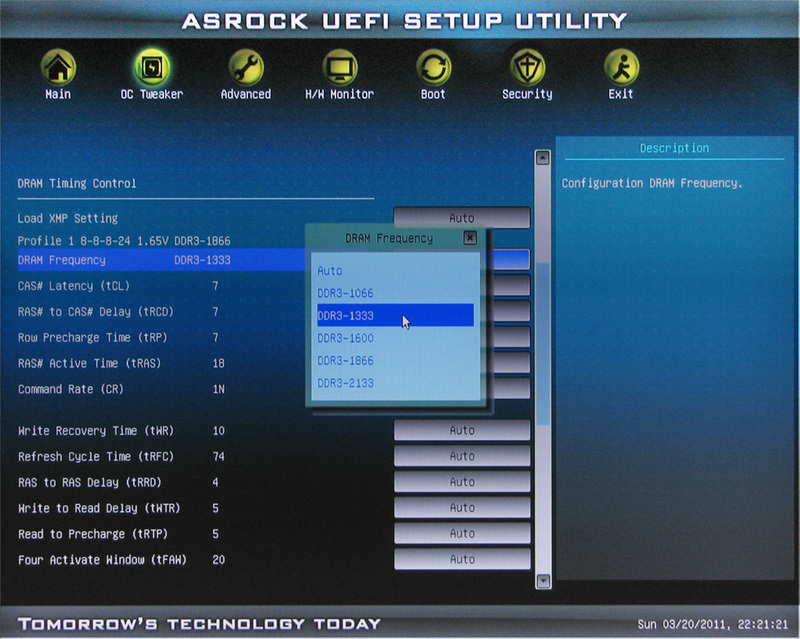 ASRock's UEFI also has a GUI that was obviously created for the high-end Extreme boards. Naturally, it doesn't introduce anything new. And calling it a 'graphical' interface is a bit of an exaggeration, because there are no purely graphical screens, but rather a good old BIOS Setup with a skin on it. 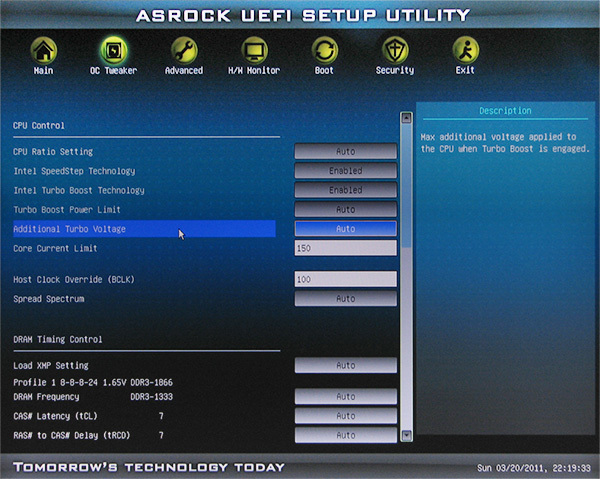 The UEFI visually resembles that of ASUS boards (e.g. ASUS P8P67 Deluxe). Fortunately, we didn't expecrience any problems the UEFI of MSI P67A-GD65 had. We can but repeat what we said last time: a regular user doesn't not need a graphical BIOS at all, because he'll use it once or twice in motherboard's lifetime. Creating a whole new interface for that just isn't worth it. The BIOS itself offers familiar features, including storing/loading profiles, firmware upgrade from flash or other drives (Instant Flash), quick selection of bootable device. Overclocking parameters are not impressive at all (as you remember, this isn't a high-end overclocker board). But you don't need that much for a Sandy Bridge processor anyway. P67 Pro3 doesn't offer a multitude of low-level settings, doesn't allow increasing memory voltage to more than the meager 1.8V or increasing BCLK to more than 110 MHz (which is unreachable anyway). 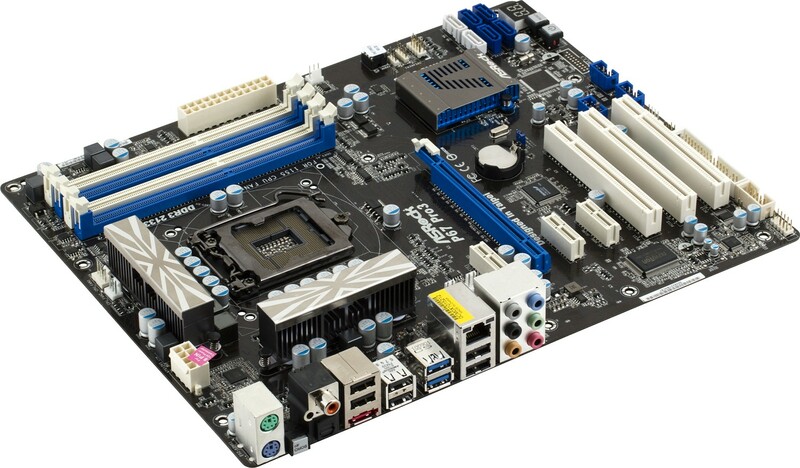 As you can see, ASRock clearly isn't going to sell this motherboard to overclockers. Strangely enough, P67 Pro3 doesn't allow to adjust multipliers separately for each core in the Turbo Boost mode (Limited Unlocked), even though it's a more or less usual processor feature. Power consumption features are also standard: you can set the desired TDP and a maximum overshoot, as well as the averaging time frame for power consumption calculation (the longer it is, the longer a processor can exceed TDP, up to 56 seconds). Besides, you can also adjust current limitations (150A by default).